Graeme from Suzi Auto recently brought in a decent quantity of Leaf batteries from overseas. The supplier threw in for free some BMS units. These came in the form of an ECU (Electronic Control Unit) and what turned out to be a contactor box, connected by a common cable. Weber and I have been investigating Leaf drive systems, so Graeme kindly asked if we'd like to take one and do a quick disassembly. How could we refuse? The connectors along the bottom all go to individual cells. So this is not a cell-top BMS, it's the other kind, where the management/monitoring happens away from the actual cells. As most readers of this forum will know, Leaf battery cells are packaged into 2S2P "cans" with three screw terminals. There is a nifty flexible orange plastic harness arrangement that screws to the cells, making the interconnections (from memory, maybe that's not right) but also the connections to the BMS. Note the four larger resistors (0805 size, about 2 mm x 1.25 mm, still pretty small), marked "431". These are 430 ohm resistors, and would appear to be the only possible bypass resistors. If so, these would have a maximum of about 4.3/430 = 0.01 A or 10 mA of bypass current. This is about a tenth of the current of the next lowest BMS bypass capability, so maybe they're not bypass resistors at all. If these are bypass resistors, bypass capability is extremely weak. Power dissipation would be around 43 mW; these resistors are generally rated at 125 mW with adequate heatsinking. So they are sized about right for taking around 4.3 V (the approximate potential of one Leaf cell near full charge). The two rectangular black boxes with the Panasonic labels are the main contactors (breaking the positive and negative ends of the pack, by the looks). The coloured wires go to a smaller contactor, which must be the pre-charge contactor. It is associated with a ~ 20 W resistor under the contactor unit. This unit oozes quality; all the quick-connect connectors have plastic boots; every place where battery (circa 400 V) potential exists in a small space has a substantial plastic barrier separating the terminals; the bus bars are a work of art, and so on. So: will these battery monitoring (and possibly very weak management) units be usable by converters? Well, the contactor box is pretty neat, if your conversion doesn't need a heap of current. The BMS ECU... well, it's designed for a 96S (~ 365 V nominal) pack, and I don't think it would take too kindly to a bunch of cells being missing. However, if your pack had a multiple of 4 cells in series (i.e. an even number of cans), then you would not be using half a channel, so it may be possible to ignore or bypass the unused channels. The ASICs appear to communicate to each other digitally, and there are opto-couplers at end ends of the pack. 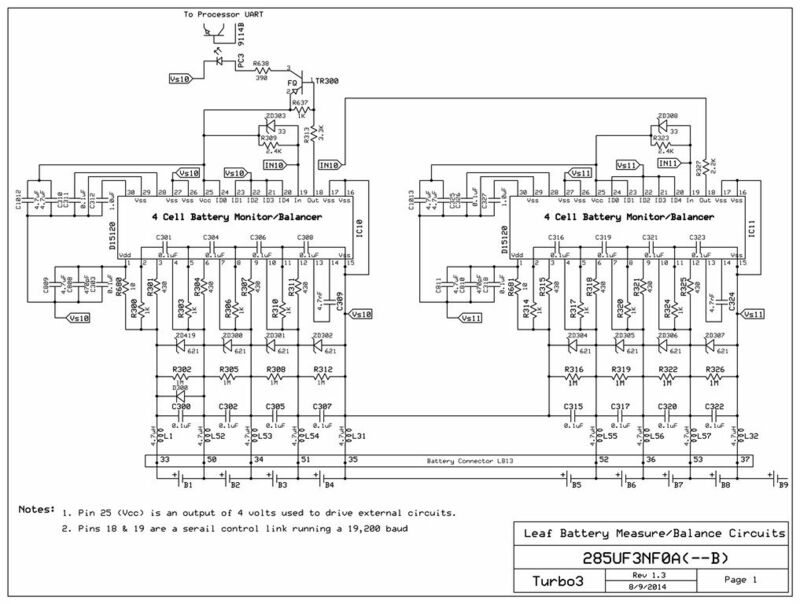 There are more details, including a schematic, here: My Nissan Leaf article "BMS details" . So you could perhaps intercept the digital stream on its way to the BMS master, which you might be able to ignore, but then you'd have to figure out what the digital stream meant. That might be easier than trying to figure out the CAN bus packets that the vehicle normally uses to communicate with the BMS master. So: a fair bit of work. Turbo3 has an Android app that shows which cells are in shunt via a Bluetooth CAN dongle. Doesn't make a whole lot of sense to me, often cells with a lower voltage are in shunt & ones with a higher voltage aren't. Last edited by PlanB on Thu, 04 Sep 2014, 06:50, edited 1 time in total. Thanks for the inspection and links Coloumb. His "sketch" of the board has a 0.1uF filtering the 4.7uH on the path the cell terminals. He has schematics for the Mid and Bottom pairs of ASICs. The 0.1uF stumps my idea the ASIC may be using buck [oops should be boost] converter to step up the voltage across the 430R resistor using the 2 X 4.7uH inductors? The 0.1uF is only a small "stump" and the effeciency is not the goal. So the chip could be using boost from the inductors to dissapate power into the circuit. Similarly the negative side inductor can pull current via the reversed (-0.8V) zener from the cap on the cell bellow. mmm... I haven't heard of DA .. could it be "dual" diode or just a FET. They use TR for NPN transistors. If the DAx's are fets or the like they could also play a part in the boost function with L13 too. Might need to draw some colored lines on the schematic. Last edited by 7circle on Fri, 05 Sep 2014, 09:38, edited 1 time in total. Ken, my take on the 4.7uH inductors is that they are only there for RFI and EMI suppression. I.E. 25W Taxi transceivers could play havoc with the cell balancers without RF suppression. While we normally user ferrite beads and 100pF in Mobile radios (sometimes 1uH chokes), the 4.7uH may be to remove motor controller pulses as well. Trying to recover from the thought of a taxi stand with 10 taxis pulsing out 250W of EM. I can see the need for filtering on the long connections to the batteries. But somehow the circuit leads me to think there is more going on. With each channel having 4 connections to the D15120-ASIC there are more possibilties than just the 430R as the shunt. Will see if Coloumb or Turbo3 show up more info. I was wondering if Turbo3's sketch was correct. The cell to cell approach is old news but I don't see it in the the eBikes or EV's. This chapter (4) Barsukov PDF on Cell Ballancing shows different techniques. TI/BQ and LinearTech have high efficiency Cell-to-cell balancing chips. 7circle wrote: mmm... I haven't heard of DA .. could it be "dual" diode or just a FET. On re-reading this, it occurs to me that DA may well stand for Diode Array. cheers, was hoping there might be a label or part number the socket. but, i think will just replace them with something else. Does anyone have the circuit or any more information on the operation of the hall effect current sensor that's mounted on the contactor assembly? Last edited by jateureka on Wed, 25 Mar 2015, 03:36, edited 1 time in total. 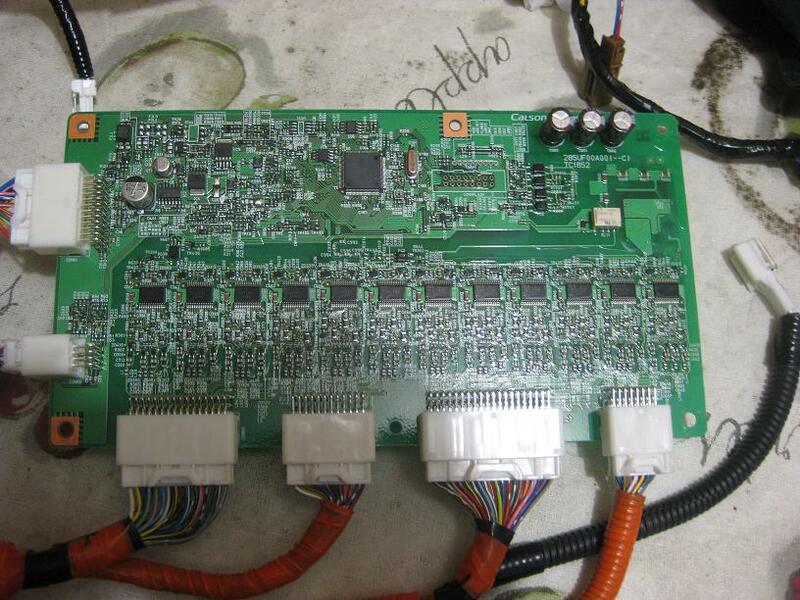 jateureka wrote: The ev wiki says it is +/- 2.5V, but the mynissanleaf BMS article said he was reading 3.162V no load and 3.162V with 3A charge current. That's still possible. The LEMs that I use at work have an output centred at 2.5 V, from a 5 V supply rail. So these measurements could be to ground, instead of the 2.5 V reference. It's also possible, but much less likely, that they have true differential outputs, so that +/- 2.5 V on two outputs can see +/- 5.0 V between the outputs. Sorry, I have not looked at the specifications to see what type of outputs it has. coulomb wrote: Sorry, I have not looked at the specifications to see what type of outputs it has. So I'd say that they are single outputs, centred on 2.5 V, and the quoted measurements were with respect to ground. So subtract 2.5 V from those measurements to get a value proportional to current. Last edited by coulomb on Wed, 25 Mar 2015, 02:37, edited 1 time in total. Very interesting. Is that yours, Reecho, or just spotted somewhere? 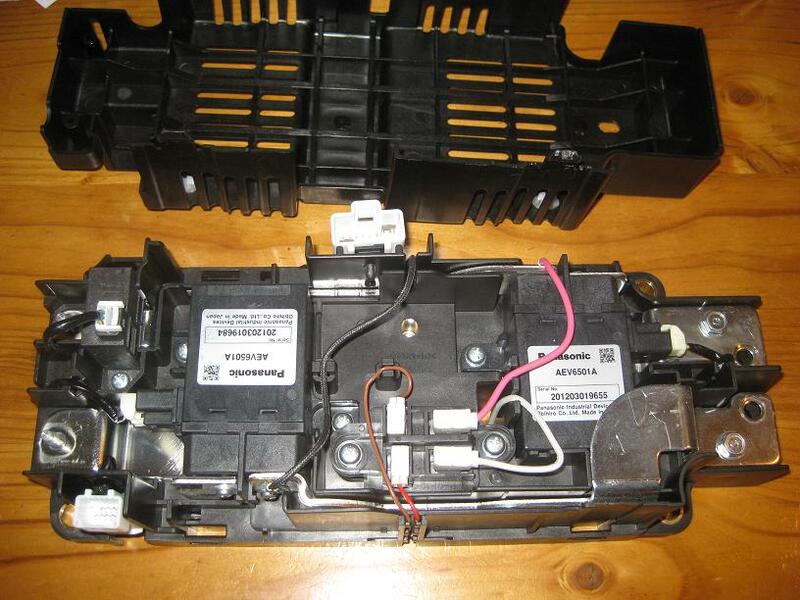 I also see a photo of another cabinet with Nissan Leaf cells; is that part of the same system? (On photobucket, clicking on the image in your post) . Ah. So I should have been less lazy and done a Google image search. I note that Google seem to have translated the Norwegian currency, the Norwegian Krone, into Euro dollars and Euro cents. Today, the Krone was equivalent to AU$0.17. It seems to be 30 kWh (perhaps expanded to some 35 kWh later), 48 V. I'd like to know how he overcame the problem of 50 V not dividing nicely by 7.8 V nominal Leaf modules. Weber and I may use Leaf Modules in a monolith solar system soon, and I think the plan was to use 6.5 modules in series (wasting one pair of cells in each set of 7 modules). Last edited by coulomb on Tue, 07 Apr 2015, 04:40, edited 1 time in total. I like how it nicely fits in a 19" rack - and wheels to boot! "This would be 14 x 4.2 = 58.8 V if fully charged"
Thats not to bad if using components designed for 48v flooded lead acid chemistry that can be 60 volt + during EQ charging. Especially if you conservatively charge the leaf cells at less than 4.2v. So for the most part, he's just brought each original 100-pin signal to the nearest PIC pin, thus minimising the number of vias and crossovers, and making the PCB simple, and this practical to route when it's so small. I have doubts that he will be able to merely paste the PCB on with a hot air gun, so I'm keen to hear how this progresses. It would be interesting if this technique, or some variant of it, is able to progress the art of re-purposing OEM equipment like this. Wow, that is some plan! It does seem ambitious to get all 100 connections soldered on in that manner. Will be interesting to see how he goes. Please keep us updated! I read Tesla has made a lot of their tech open source, it would be awesome if one of the manufacturers made their battery tech available for converters, it would be a whole new area for them and would not impact their regular sales as converters are going to do it anyway. If Nissan battery systems were available to use in conversions it would also add to the value of the Nissan components. Unfortunately, I don't think any of the companies are truly visionary, except maybe Tesla. So many potentials available you would think they would be jumping at the chance to become a real dominant force rather than just another "me too".